To register, please contact Rachael Frye at rfrye@schneiderdowns.com or 412-697-5251. If you can't attend the Pittsburgh event, we invite you to join us in Columbus on October 22. Juan Rivero has over 17 years of experience in public accounting. He possesses extensive experience with tax, compilation and tax engagements and business valuation. Juan joined Rivero & Olivares in 2000 after a five year career in the PricewaterhouseCoopers tax department and special M&A projects in Mexico City. He graduated from Universidad Iberoamericana in 1998 and became a partner in 2002. He is a CPA for Mexican purposes. 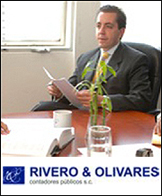 He earned his Masters in International Taxation from the Universidad Panamericana in 2007. He is a candidate to be a Certified Business Valuation Analyst, by NACVA. Juan currently heads the Tax Department, Transfer Pricing Department and M&A Reviews at the firm.